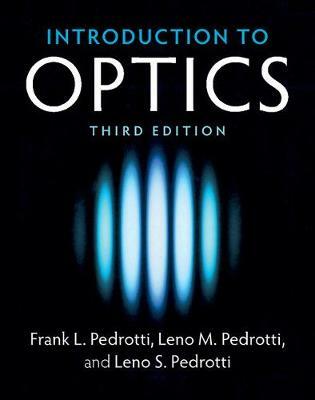 Author(s) Pedrotti, Frank L.; Pedrotti, Leno M.; Pedrotti, Leno S.
Introduction to Optics is now available in a re-issued edition from Cambridge University Press. Designed to offer a comprehensive and engaging introduction to intermediate and upper level undergraduate physics and engineering students, this text also allows instructors to select specialized content to suit individual curricular needs and goals. Specific features of the text, in terms of coverage beyond traditional areas, include extensive use of matrices in dealing with ray tracing, polarization, and multiple thin-film interference; three chapters devoted to lasers; a separate chapter on the optics of the eye; and individual chapters on holography, coherence, fiber optics, interferometry, Fourier optics, nonlinear optics, and Fresnel equations.